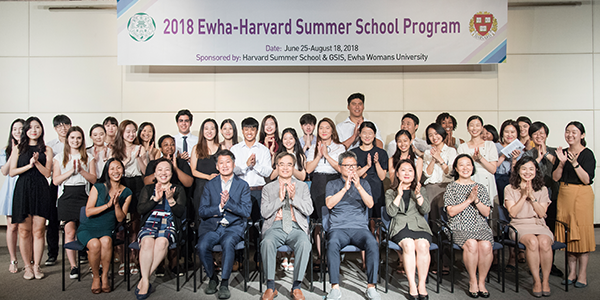 Ewha Womans University Graduate School of International Studies (Dean Kim Young-hoon) successfully ended the ‘2018 Ewha-Harvard Summer School Program’ in collaboration with Harvard University, in which students of Ewha and Harvard University jointly participated, and held the closing ceremony on August 3 (Friday). ‘Ewha-Harvard Summer School’ is the summer education program which is hosted by the Graduate School of International Studies and conducted by Harvard, the prestigious US university. This is the only occasion where Harvard co-organizes a summer session program with a Korean university. It has been held every year at Ewha’s campus since 2006 when the two universities strengthened the partnership. Participants in this program commenced on June 25 (Monday) included Ewha and Harvard students, and other students from universities entering into a credit exchange agreement with Ewha and Harvard. The Korean language class for Harvard students opened until August 18 (Saturday). Ewha-Harvard Summer School organized focused on Korean culture and history carried out this year joint research projects, under the theme of ‘Viewing the Social (developmental) history of Korea since the Korean War through Movies,’ concerning ‘political, commercial and artistic presentations on Japanese comfort women,’ ‘criticism of marriage’ and ‘the culture of Goryeojang (meaning “ancient burial practice whereby an elderly is left to die in a tomb”) in the past and the problem of elders who live alone today.’ Students watched the movies describing modern Korean society such as Aimless Bullet (1961), Chilsu and Mansu (1988) and To the Starry Island (1993), and had a time to discuss them. Director Lee Jang-ho and leading actor Ahn Sung-ki of the film Good Windy Day (1980) were invited and gave lectures. Every week, students visited main attractions in Seoul such as Changdeokgung Palace, a historical site, and the National Assembly Building, the War Memorial of Korea, Namsan Mountain and Cheonggyecheon Stream, in order to experience Korean culture. They also went field trips to DMZ (Korean Demilitarized Zone), and Naksansa Temple and Seoraksan National Park in Sokcho-si. 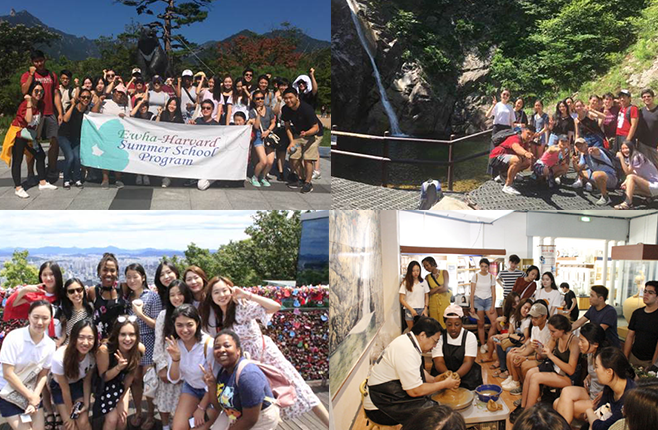 In Ewha-Harvard Summer School, students shared daily lives alongside learning by living together in the dormitory while taking one-to-one language and culture exchange partner program, which was a deepening summer session program.